eat less meat with more homemade soups,and homemade bread that i do in a breadmaker. W ear eating more organic fruits and veggies and also eating brown rice rather than white, wheat pastas, eating things like couscous instead of potatoes as a side and trying to only eat wheat breads. 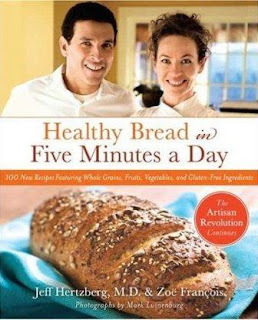 I have been experimenting with making my own breads and would love to win this book! I am making sure to drink 8 glasses of water to stay healthy these days! I also entered you popcorn tin giveaway! I exercise daily, drink lots of water and try to limit how much processed food I consume. I don't make bread because I always thought it would be too time consuming so maybe this is worth a try. To stay healthy I am exercising and trying to get my daily amount of water in. Would LOVE this book. With money as tight as it is I'm making all of my bread at home now. I follow you on Twitter as @ParkerMama! We eat a vegetarian diet, and I'm seriously considering going vegan. What I am doing to stay healthy is to start taking my meds as prescribed, cut out all sodas, to eat more fruits and veggies and to practice portion control. I have been pretty well and staying on plan lately. We exercise and try to eat healthy! I drink lots of water. Thanks! I subscribe by google rss feed. I am probably not doing enough to stay healthy, but I exercise 4 times a week. I need to up my fruit and vegetable intake, sounds like a good new years resolution to me. 2010 means exercise increases to every day and I'm giving pop up at some point this year. I entered the Monopoly Championship giveaway. I'm taking probiotics to improve my health. I haven't caught nearly as many viruses since I've been taking them. To stay healthy I started practicing yoga again. So far so good! Thanks for the giveaway. We are eating more whole grains, fresh fruits and veggies. We use mostly Olive Oil for cooking now. we are eating our bigger meals at noon and having lighter suppers, usually a good salad. Snacking is reserved for the weekend. We are trying to eat more fresh fruits and vegetables. I'm eating plain yogurt every day for lunch - yuck, but healthy!